When I was introduced to Shamanism some 20 years ago some thing in me woke up. I’m not native by blood nor pretend to be, yet that said, my blood resonates with the sap flowing throughout nature. In my soul I am one with all manifestations of nature, the birds and animals, the herbs and trees, the crystals and stones, and the waters and soil, we are intrinsically entrained to each other. We all are. When the Shaman’s Drum beats my heart answers. My head forgets all ideas of separation, individuation and ego, there exists only the steady beating of a sacred heart that connects all life force as one. I have practiced and studied shamanism, but this dance, this feeling that I speak of here is primal, natural and inherent to all. It is beyond culture or race or borders. It belongs to each of us, to humanity. The earth and us humans belong together – we breathe one breath, we sing one song, and we pound out the beat together of one heart. This that I am speaking of doesn’t need to be studied – it needs to be felt and experienced. It needs only to be re-awakened. As I began to wake up to the sacred beat of life there awoke in me also the power of healing. As I awoke to the power of healing in myself I also understood that what I healed in me I healed in the world around me. I further understood that that’s why we are all here at this time, to heal; ourselves, each other and our beloved earth. We are here and now because our consciousness is duty bound to evolve into health. Not to grow beyond the need to be on earth, but rather to celebrate a glorious manifestation of vibrant healthy life – all together. Let me attempt to share what I feel when the drum beats. The drum beats. Low, steady, monotonous beats. A heart beat. The heart beat of the Earth. Lying on the ground I envision my sacred dance. My feet firmly planted on the soil as I intentionally attempt to connect with the heart of the Earth. My eyes closed, arms hanging relaxed and head gently falling forward I focus on my core, my center. I intend to connect with the earth as I listen to the beat of the drum. I feel my energy reach toward that heart of the great mother with every drum beat, with every breath I consciously send my energy deeper, deeper into the soil, to the soul of Earth. My intentions however, can only go so far. “Trust your heart to take you to Her”, I hear the words as clearly as if they were spoken in my ear. My heart meets the drum. My soul reaches to meet with Hers. The drum keeps beating. 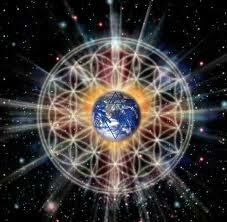 The beats resonate with the vibration of my heart, with the vibration of the earth mother. It is undeniable. At essence we are one. Her and I. My spine begins to sway, in time with the beat, lost in the rhythm all conscious thought stops, only the rhythm is known now. Only the beat, only the vibration matters, all else fades away. The drum beat changes to match the vibration of my energy and the energy of the earth under my feet. The dance begins. The drums of the whole world come together to beat the same rhythm. All the dancers on the earth begin to dance the same dance. We are one, bound through the dance and our love for earth, bound through the heart of Earth, through our feet. All feet that walk upon this same soil of Earth can feel this rhythm, belong to this same rhythm. We are one, bound through our beating hearts and our beating drums. And as the beat goes on, and my spine sways, I feel my energy swell beyond my body, undulating with the pleasure of having found my homing rhythm. 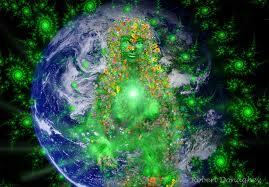 I become empowered as the earth shares her energy and power with me, just as I have shared all of mine with her. We have transfused each other. We have nourished each other and now we celebrate. The drum beat changes again. Now she is pushing, pushing me to recall all that I know about myself and my world. As I hesitate, she pushes harder, until in a flood of emotion I recall another hidden part. More energy surges through me, reaching through up to the heavens. The drum beat is complex, tantalizing, teasing, pushing, pulling, the entire body moving easily with the beat of the drum. No mind. Just feeling, responding, initiating, trying to keep up with the relentless energy of the drum. I rely on the energy of the drum to keep my heart pumping, knowing that it will, always, be in sync with the mother, as she keeps me. The ecstatic moment of realization of Oneness comes and holds fast. All is well. The moment never passes. All of the past catches up instead. All of the future collapses into here and now. Nothing is lost, everything is gained. And the drum changes again. It slows to match the heart of earth. We have discovered a new understanding. A mutual evolution. There is a stronger bond now than before and as the drum beat slows once again to a heart beat . The Earth and I and all the dancers of the earth send prayers of gratitude for each other as we hold each other in sacred space until our next dance. In this way does the drum speak to me. So profoundly. Each dance changes me, each one more memorable than the last. Invariably there comes emotional releasing and then emotional relief. The pent-up anxieties that have been niggling and bothering me are gone, the body feels freer, more able to be of health and vitality. Yes definitely more vital. More in tune, attuned to Life Energy as it surrounds me, there comes a greater ability to stand outside the chaos and see more accurately within the soul of life. The oneness of life between us all touches me deeper than ever before. The chaotic separateness of individual struggle is further removed. And with that come peace and with that the ability to be of service to a fellow traveller.